Meaty Chicken and Rice & Everything Nice – A classic chicken and rice soup with homey flavors to remind you of grandma’s home cooking. – Ingredients: Chicken Stock (Water, Chicken**, Onions*, Celery*, Carrots*, Garlic*, Spices*), Chicken**, Onions*, Celery*, Carrots*, Rice*, Parsley*, Butter*, Rice Flour*, Salt. Veggie Who Framed Ginger Rabbit – Sweet and savory carrot soup with a dash of cilantro and a strong punch of ginger. – Ingredients: Carrots*, Water, Onions*, Ginger*, Cilantro, Heavy Cream**, Butter*, Salt. Vegan – White Bean, Tomato, Fennel – This vegan soup is slightly savory, slightly sweet, and totally tasty! Not a fan of fennel? Trust us give it a try, you will love it! – Ingredients: Fennel*, Onion*, Gren Bell Pepper*, Green Onion*, Roasted Garlic Paste, Chili Flake, White Pepper, Thyme*, White Beans*, Diced Tomatoes, Crushed Tomates, Veggie Stock*, Canola Oil, Salt. Chef’s Choice Brazilian Black Bean – Sweet and spicy black bean soup made with jalapeños, molasses, lime juice and red wine vinegar. – Ingredients: black beans*, vegetable broth (water, Onions*, Celery*, Carrots*, Spices*), onions*, celery*, carrot*, lime juice*, canola oil*, red wine wine vinegar*, Braggs liquid aminos, molasses*, garlic*, cumin ground*, fresh jalapeño* and salt. Thai style soup created with curry, fresh lime, lemongrass, chicken, mushrooms and rich coconut milk. A wonderful and complex flavor from the best kitchen in Soupland. Smooth sweet potato soup with Indian garam masala seasoning and our in-house veggie broth. This vegan soup has all the bounty of the growing season. We take fresh zucchini, rainbow chard, yellow squash, carrots, and add hearty great northern beans and rainbow quinoa. This soup get us so excited for Fall! A hearty soup with the right balance of spice and a touch of cinnamon. You will be licking out your bowl and asking for more. The perfect bowl of soup for a cold winter day. We start with organic mushrooms and veggies and add just the right amount of cream and yummy wild rice blend. Yum! Our vegan take on a tremendously flavorful Indian curry soup. Made with cilantro, coconut milk, peppers, beans, barley and more. An homage to our president’s home vegetable garden. This tasty soup has broccoli and cheddar flavors accented by basil and ground mustard seed. We got cake courtesy of SoupCycle! It’s a 5 year anniversary. Come and get your free cake! SoupCycle is celebrating. Come help! In April, SoupCycle Corvallis is celebrating our 5th anniversary, and we are having a party! 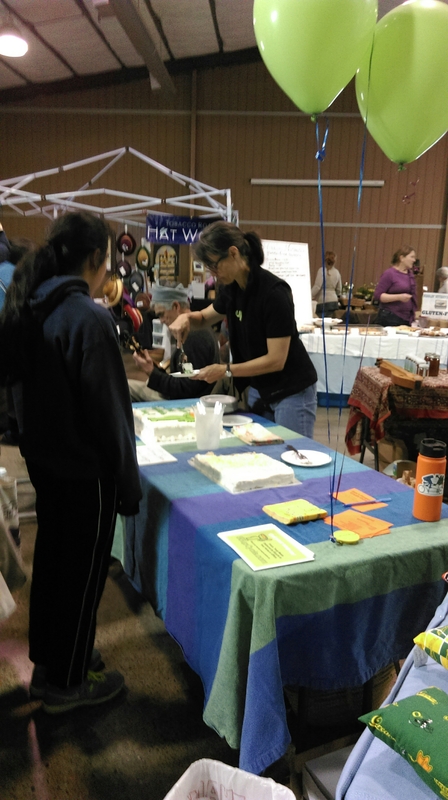 We will be at the last Indoor Farmer’s Market on Saturday, April 11 from 9:00am to 1:00pm. Enjoy chocolate cake from New Morning Bakery, gluten-free lemon cake from Nibblin’ Nuthatch, and samples of our delicious soup. Bring a friend–if they join SoupCycle that morning, you both get half-off your week’s order. You will find lots of parking in the South lot; walk through the covered RV parking to find us. It’s St. Patrick’s day and we’re giving away baskets again! This month we are giving some green in two ways. The bags full of vendor donations you’re accustomed to and this month some chances to win (more than one) $5 tokens that can be spent with any vendor in the Corvallis Indoor Winter Market. Come join us Saturday, 9am to 1pm. Benton County Fairgrounds. Our entrance is off Reservoir Av.